It's the 15 year anniversary of the opening of the Schlitterbahn South Padre Island Waterpark! Isn't that AWESOME!? It was built-in 2001, and this park is home to the Transportainment River system that is designed to maximize time in the water and eliminate lines. This river system connects eight attractions that feature rapids, chutes, and gentle currents. It really keeps the park continually moving along the river. Schlitterbahn truly believes that when you come to the beach, you should just be able to sit back and enjoy your tube ride while you tan. To celebrate this 15th year Anniversary Schlitterbahn is waiving their venue fees for Quincaneras this year! Amazing right!? In honor of the 15th anniversary we took a trip to Schlitterbahn in South Padre Island to experience it ourselves. And lucky for us this trip landed on our sweet Sadie's 7th Birthday. It was a surprise trip for the kids and they LOVED it! I have learned so much experiencing it first hand. I can't wait to share all my tips and tricks to help you and your family have the best experience possible. I love saving money, on everything and a trip to a water park can be pricey or you can choose to be frugal. Click here to see ticket pricing. Get a group together to get the group rate. This requires a group of 15 or more. Be sure to check the weather for the day you are going. Also check the park calendar (online or by calling) and make sure there is no big event happening on that day or it will be super crowded and lines will be longer than normal. Click here for dress code. Plan to arrive early at least 30 minutes before the park opens (10 am here at SPI), for good parking and a good spot to picnic. There are many great free places around the park to picnic. When you first walk in there are umbrella tables. Towards the back there are wooden picnic tables under the palm trees. And if you have little ones a table with shade by Sand Castle Cove or the Lily Pad is a must! Also when planning on being there all day don't be afraid to let your little ones nap. A quite break will energize them for more happy play later. The back of park where the picnic tables are located. Don't forget sun hats, towels, and cheap sunglasses it is really bright. I wear prescription glasses and almost lost them a few times from overhead spraying so secure them with a cord. Of course at a water park you need sunscreen but you also need to apply it at home to give it time to fully dry before hitting the water. Lesson learned the hard way we all are a little sun burned. Another tip is to get the kids long sleeve water shirts trust me if you don't want to track them down to reapply sunscreen and let it dry they need these! Also make sure to have water shoes the cement does get really hot. Another thing we did to save money was pack our lunch, water, and drinks. YES! You can bring in food and drinks. No glass or alcohol. We packed two ice chests one with drinks and the other with food. They both fit perfectly in our wagon to make walking from the parking lot with little ones easier. Check out my Pinterest board for packing if you don't want to stick to simple sandwiches. The pepperoni pasta salad is a kids pleaser. Next time I will individually package everyone's portions so it is just easier when we are at the park. Don't worry there are plenty of trash cans. Next time I might even wrap some ribs in foil the sun will keep them warm while we play! Click here to find more great packing tips from the Schlitterbahn blog. We actually brought in cupcakes, balloons, and a pretty plastic tablecloth since it was Sadie's Birthday. It was really cute and I really recommend a tablecloth. The cupcakes melted in the heat-that was a bad idea. One of the cooler cabanas! You can also choose to head to the park without a worry over arriving early for a shaded area by renting a cabana and leave the ice chest at home because you can get catering straight to your cabana. Another dinning option especially for teens is giving them splash cash. Here are some of the dinning options and prices you will find in the park. The restrooms are located at the front of the park along with a shower area. There is also a small two stall restroom on Cabana Island. This park is known for Rio Adventura, the parks river transportation system from this river you can access the Storm Chaser, Sea Blaster, Pirate's Plunge, Agua Blanca Tube Chute, and Gale Force. All from your inner tube! They even offer double tubes, and double tubes with a hole on one side and a seat for smaller children on the other. We all enjoyed riding on the tubes in Rio Adventura. It took a while to find two tubes with seats for Ezra and Dad and Sadie and Caydence, but once we did we just floated around the whole park 4 times, which took up most of our morning. They loved it so much! At first I was little terrified for the girls to go alone, but me being on a single tube made it easier to paddle towards them. One of our favorite rides! Squid Row has the softest flooring and was the best place for Ezra while he was warming up to the park. The girls enjoyed it too! Click here to see all the attractions Schlitterbahn South Padre Island has to offer. See the park map here to help you plan. By the time we were done the little ones were due for a nap and Sadie was super energized then fell fast asleep on the drive back home. 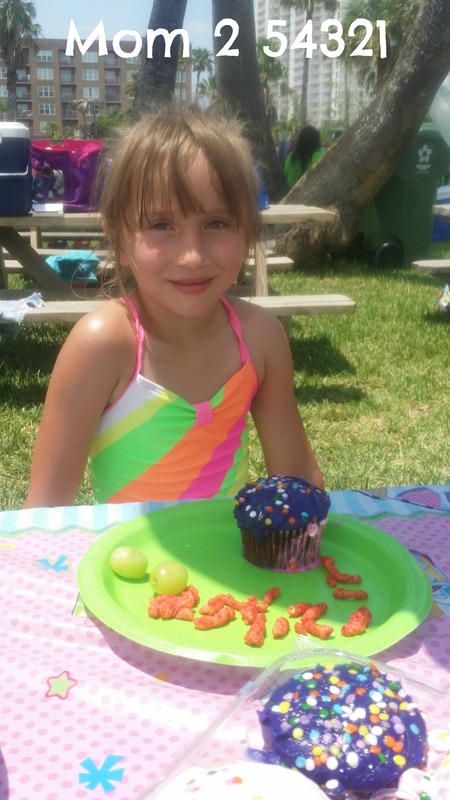 We had a wonderful, fun-filled day or in Sadie's words, "It was the BEST BIRTHDAY EVER!" I hope this post inspires you to plan a Schlitteriffic Day for your family! Top 5 Things to Know When Visiting Schlitterbahn South Padre Island Beach Resort in the Winter! We are blessed to live not far from South Padre Island here at the tip of Texas. Schlitterbahn Galveston...The Best Day EVER!